Summit Industrial Income REIT (SMU-UN-T) ended a very busy 2017 by entering a joint venture partnership with Urbacon to develop, own and operate digital data centres across Canada. Toronto-based Urbacon previously developed industrial properties for joint ventures with an earlier incarnation of Summit, and that history makes for a solid fit. “Urbacon wanted a partner who they are familiar with and comfortable that we understand the development business and can move quickly,” Summit chief executive officer Paul Dykeman said of the deal, announced on Dec. 27. While Summit has received exclusive rights to participate in Urbacon’s future data centre projects in Canada, it launched the partnership with the purchase of a 50 per cent stake in Data Centre One (DC1) in the Barker Business Park Digital Campus in Richmond Hill, Ont. Summit will acquire its interest in the property from Fonds de solidarité FTQ, assuming its 50 per cent share of construction debt for a total equity investment of $15 million. 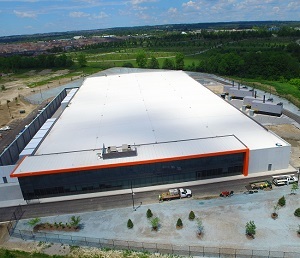 DC1 is a new, purpose-built, state-of-the-art 10-megawatt data centre 50 per cent leased to a major global cloud provider under a 15-year term. The tenant, which can’t be named due to confidentiality agreements, has an option to lease the balance of the building. The centre has the highest level of security, state-of-the-art cooling systems, and redundancy in back-up batteries and generators. “The infrastructure in that area is newer and the power supply is very reliable,” said Dykeman. “Urbacon is going through the permit phase to develop DC2, for which construction could start in the spring. Summit has extended a three-year, $14.3-million working capital loan to Urbacon, primarily to develop additional data centres in the Barker campus and other markets. Summit has also extended a $15.8-million mezzanine loan to Urbacon, with which the developer will purchase Fonds de solidarité FTQ’s 50 per cent interest in the only stand-alone, purpose-built data centre in downtown Montreal. Summit has the option to convert its loan into a 50 per cent ownership interest in the recently completed property. The nine-storey building is power-ready for occupancy with 16 megawatts of power available, which can be upgraded if required. It can be leased entirely to one large tenant or on a floor-by-floor basis to smaller ones. “In Canada, more of the data centres are owned by big telcos, whereas in the U.S. more of them are owned by data centre REITs,” said Dykeman. “We see a unique opportunity to create a portfolio. The overall $45-million initial cash investment in the data centre program will produce an accretive yield of between eight and 10 per cent going in. The accretive returns will be further enhanced once both buildings are fully leased. With these transactions and others, Summit has fully invested its $103.5-million equity offering which was completed on Dec. 13. It has a debt leverage ratio of approximately 54 per cent. Brampton, Ont.,-based Summit almost doubled the size of its portfolio in 2017 and its value is closing in on $1 billion. Just over 60 per cent of the portfolio is located in the Greater Toronto Area, where it’s looking at developing or redeveloping properties. “Cap rates and pricing of existing properties continue to be aggressive, so development will help with building the portfolio in Toronto,” said Dykeman. “The challenge is finding land and/or buildings that can be developed. Since Real Estate News Exchange last spoke with Dykeman in late August, Summit acquired: a 255,000-square-foot light industrial property in Etobicoke, Ont. for $23.9 million in September; and a four-property, 238,783-square-foot light industrial portfolio in Calgary and Mississauga, Kitchener and Cambridge, Ont. for $35 million in November.